After going to the trouble of learning all the proper presentation skill levels necessary to hook a salmon it is 'imperative' that you also understand the basics of how to play a fish all the way to the landing net. If you're newish to this pursuit and haven't yet learned the hard way how 'not' to play a salmon here's a few pointers that I personally follow which allows over 95% of the salmon I hook to stay on all the way to the landing net. This is of course based on a proper salmon hook set being achieved in the first place! I've seen many salmon throw the hook over the years after anglers have tried to bully the fish way too early into the fight. The harder you lay into a salmon during the early stages of the fight the harder it will often resist! If you play a fish too hard you can often completely exhaust the fish which makes recovery difficult and especially during warmer less well oxygenated water conditions. On the other hand I've seen anglers making an absolute 'meal' of a salmon fight and with little rod pressure and a very slack reel clutch setting literally giving the salmon a completely free reign on proceedings. In this circumstance as a ghillie it often feels like you'll need to wait until spawning time to get a chance with the landing net! There's a definite happy medium when playing a fish that can be achieved where you can play a salmon properly and reduce its ability to use the river current against you. This tactic will bring the fight to an early close without losing the enjoyment of the battle or fighting the salmon into a state of 'panic driven' over exhaustion. This 'smart' process starts with a good bend in the rod but getting your hand off of the fly reel when the salmon wants to go. If you dare to resist giving a newly hooked fish (of any size) line when it wants it that rod will come down and all you'll hear is an almighty 'crack' as your favourite salmon fly speeds away from you forever! Let a salmon run whenever it wants to is the message I'm trying to deliver here as even an 8lbs fish will snap a 20 pound leader like thread if you try to hold it as it powers away from you. As the fight commences it's important that you get into a riverbank position where you're 'side on' to your fish. 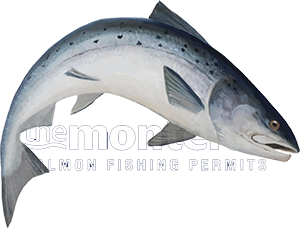 The reasons for this is that the pressure on your hook set is then pulling in to the salmon's mouth and not out of the salmon's mouth which would be the case if you try to play the fish from an upstream position. Some will say that isn't always possible but in over 40 years of salmon fishing I cannot recall any instances where I couldn't achieve a 'side on' fight position even though it did involve getting wet on a few memorable occasions! Keeping your composure and actioning the above is where half your mind should be during the excitement of battle. The other half of your mind should be focussed on looking for a deepish 'snag free' pocket of slack water in near your riverbank where you can steer your salmon to coax him out of the main current. Sometimes that can involve walking down the salmon pool a fair way but if you can look for that pocket of broken water and steer the salmon into it you'll take away the salmon's ability to use the current against you and dramatically reduce the salmon fight time. Once your fish is out of the main flow which you'll see him trying to resist (as if he knows what your trying to do) then you gain full control of the fight. At this point you've taken the weight & water pressure of the river out of the equation so the game is now truly between your fish and the through action of your rod which often won't last too long. Once that fish starts showing its flanks & tail in the slack water you're nearly there but still be cautious as there always a surge of energy left in all salmon at landing time when the fish finally sees the net. When your fish is ready for landing then in one smooth continuous movement draw the salmon over the net and simply lift the net.